A cabbie presumed to have set himself and his taxi on fire in yet another apparent suicide protest over a planned commercial ride-sharing service, died in hospital early Thursday, police said. A sedan taxi near Gwanghwamun Station in central Seoul caught fire on Wednesday night. The driver, only identified by his last name Lim, was moved from his vehicle with severe burns on much of his body. Lim's death makes the second case in which a taxi driver apparently killed himself to protest the carpool service. 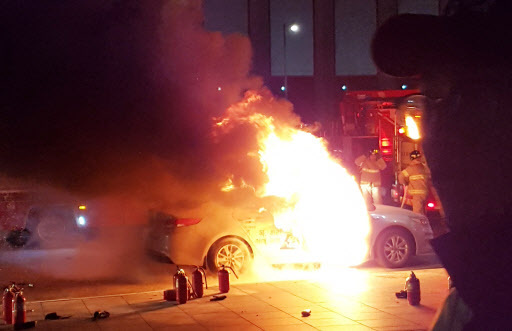 Last month, a 57-year-old taxi driver from Seoul set himself ablaze in protest against Kakao T.
Police have raised the possibility of self-immolation by the 64-year-old, in protest of the planned launch of Kakao T, a carpooling app created by a unit of South Korea's major IT company Kakao Corp. They said an investigation is under way to determine the exact cause. The local taxi industry has strongly opposed the service's market release, claiming the application will kill their businesses. Thousands of taxi drivers have staged three sit-in strikes in recent months, calling on the government to take measures to stop its launch.